I spent 3 short but glorious days in Paris in the late 1990’s and I can still remember every pastry and dessert I ate there. I began my mornings at the boulangerie next to my hotel and ordered something called a l’orangerie which is a flaky and buttery croissant-like pastry with apricot halves baked in and finished off with sprinkles of French pearl sugar. I’ve been searching for something similar to the l’orangerie but nothing I tried was memorable enough to make me want to go back for more until I walked into Petite Provence. My experience with French bakeries in Portland have been so-so. Nothing has blown my mind or has come close to the taste of the croissants and other pastries I ate in Paris so I wasn’t expecting anything more from this place. Don’t get me wrong, they were tasty but I wouldn’t make a special trip out there to buy anything more if I had the craving. 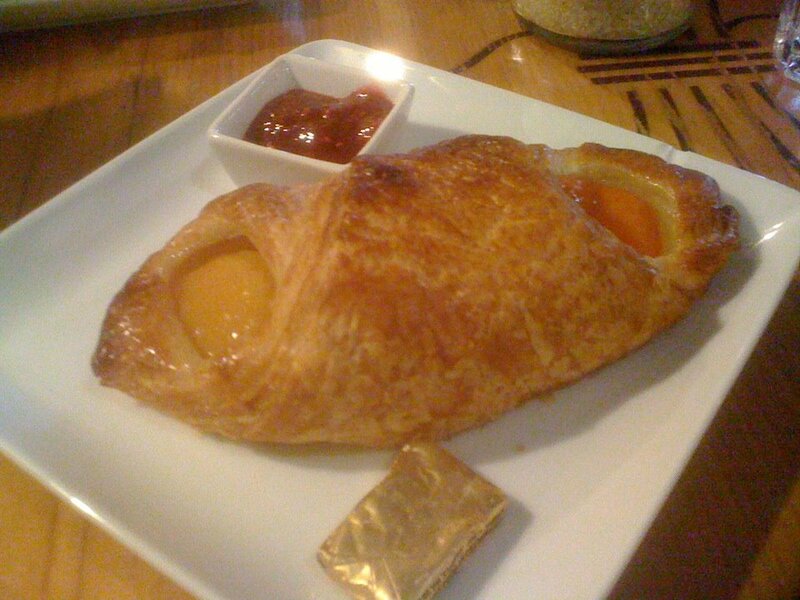 However, the apricot croissant at Petite Provence caught my eye and as I began to eat it I was transported back to Paris circa 1999, sitting on a bench outside the local boulangerie in a food trance. Their flaky layers of croissant pastry envelopes a light custard filling with apricot halves on each end and becomes something out of this world delicious. 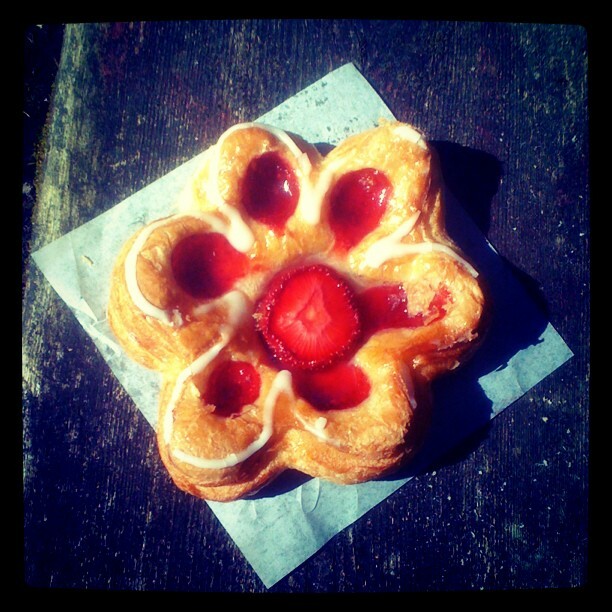 I’ve been longing for something like this for decades and it is the closest thing I’ve found to pastry bliss since Paris. I am happy I don’t have to travel far to enjoy it either as Petite Provence is conveniently located close to my work and another location is on the route I travel to go home. They also have a bistro menu serving breakfast, lunch and dinner items which I have yet to try but I am planning on it soon. Check their website below for more information. The picture above is their strawberry flower. 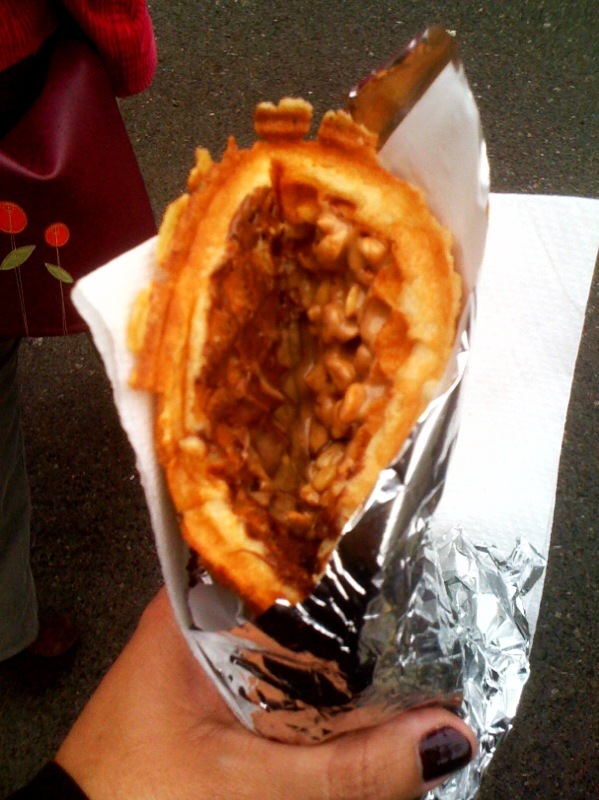 Liege Waffle: Named after the city of Liege in Eastern Brussels. This waffle is dough based rather than batter based which creates a denser and chewier waffle than the traditional variety. It is also smaller in size and sweeter in nature due to the incorporation of pearl sugar in the dough. 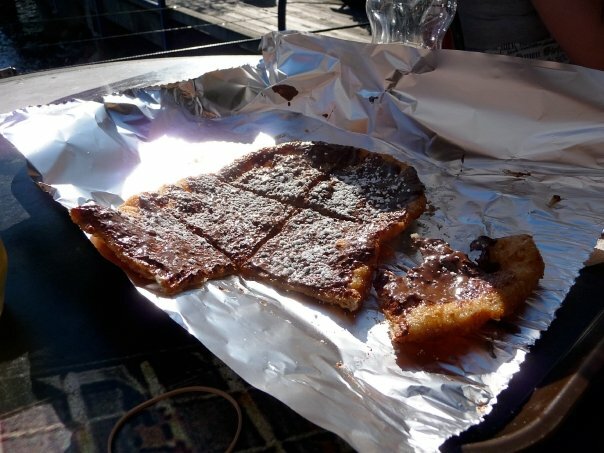 Once baked, the sugar creates a hint of caramelization on the outside and crunchy bits of sweetness in the inside. I tend to develop food snobbery from time to time only after eating something so good at one place that I can’t go back to what I’ve had previously had at other establishments. It’s happened with coffee and calamari and now it’s happened with waffles. Yes waffles! A regular waffle will no longer do. 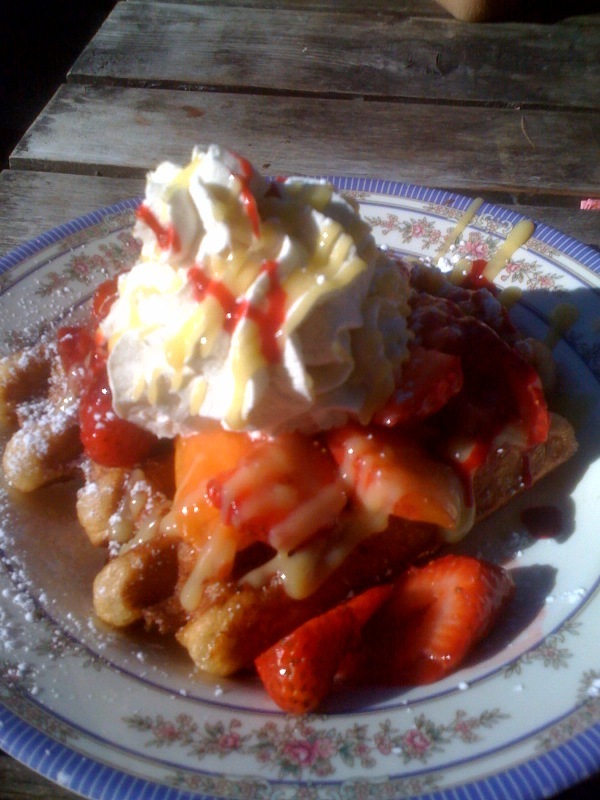 Only a liege style waffle will satisfy my waffle cravings because they are simply the best I’ve ever had. The Gaufre Gourmet food cart introduced me to them and now I’m forever hooked. My friend from Vancouver Canada was in town recently and wanted to check out the Gaufre cart but it was closed on the last 2 days of her trip here. I happened to introduce her to these waffles the last time I was visiting Canada and she wanted some during her visit here. 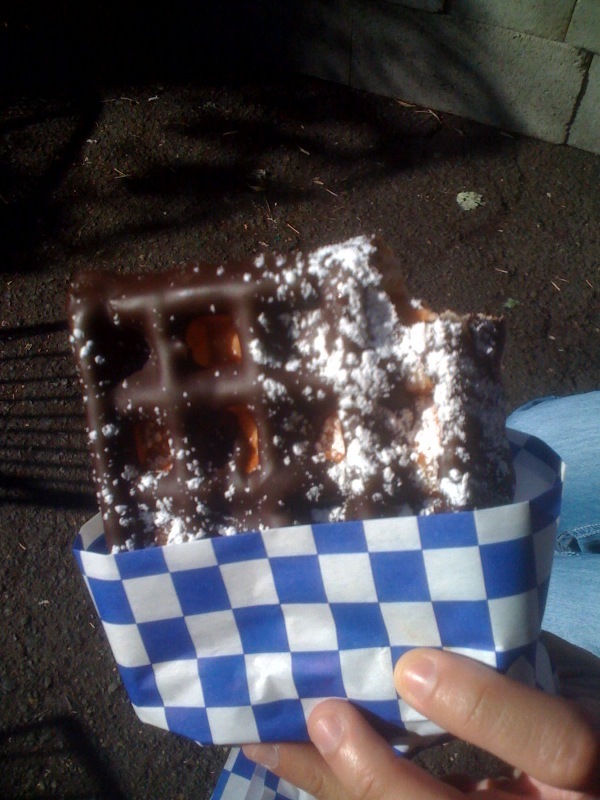 The prospect of eating a liege waffle seemed unlikely until we spent her last day walking down the streets of Hawthorne and spotted the Waffle Window. We were happily surprised that they served the magical liege waffles! I’ve heard about this place and walked by it many times but never stopped to take a look at their menu until now. My friend opted for the Guittard dark chocolate dipped waffle and I decided to try their seasonal peach and strawberry waffle drizzled with lime curd and strawberry sauce then topped with whipped cream. Sounds pretty fantastic doesn’t it? The chocolate dipped one was pretty rich and I don’t think I could eat the whole thing by myself in one sitting. I did, however, manage to polish off the fruit one with relative ease and I wasn’t even hungry. They have a great selection of waffle toppings and they get them out pretty quickly. The only thing they could improve on is yelling your order out louder since the outside seating picnic tables are far enough away that you can barely hear them. I’ve never been a big peanut butter pie fan and I’m not sure why. I love peanut butter and anything with a good crust but it’s taken over 30 years for a pb pie to blow me away. 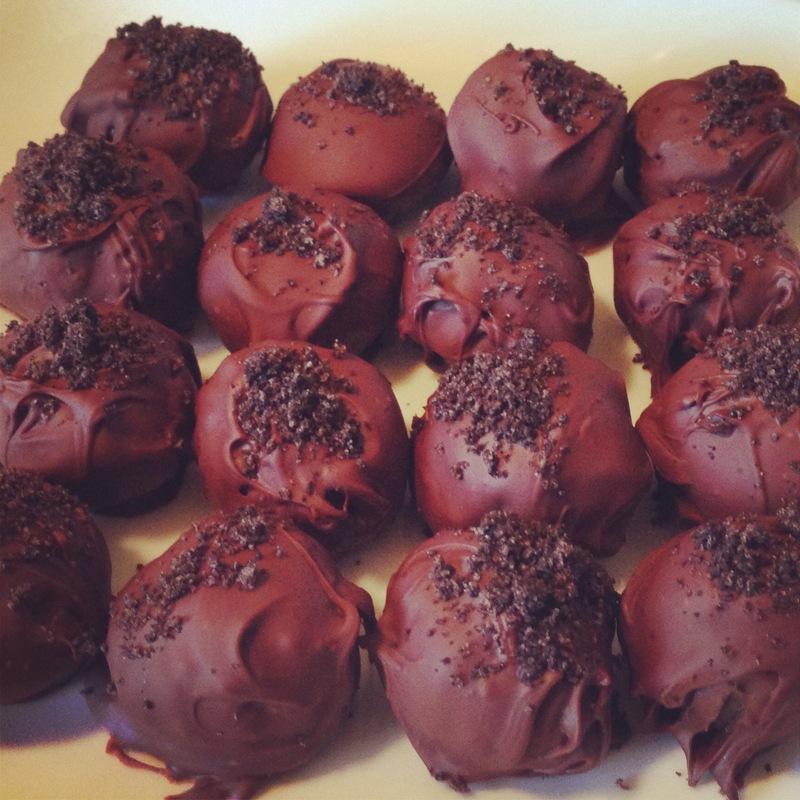 I’ve tried some homemade and restaurant ones and none of them left me really craving for more. In fact, I remember one occasion where I turned down dessert when I found out it was a pb pie. Anyone who knows me well will not believe this story but I assure you that it is true. I am completely capable of turning down dessert. It doesn’t happen often which is why I remember that particular day. Well those days of over looking pb pie are over now thanks to the Pacific Pie Company. Their version is the best I’ve ever had. Period. Hands down. End of story. I shouldn’t be too surprised because they make some great food in both the savoury and sweet department. Another reason to love them is their dedication to obtaining local and sustainable ingredients without a preservative in sight. Yay! I’ve planned my work week around buying it so I could enjoy it with another coworker who also shares a love for it. They do offer delivery service through another company if you are so inclined but there is a charge depending on the distance travelled. It’s a nice option to keep in mind but I’ve never used it to know the pricing for it. Ok, so back to the pie….It’s the one menu item that I will always go back to and the one that satisfies my sweet cravings. I’ve tried to buy other desserts just to check them all off my food list but if I stare at the dessert case long enough I can’t resist buying it. It’s like crack in dessert form and I won’t get my “fix” by anything else with the same amount of pleasure. 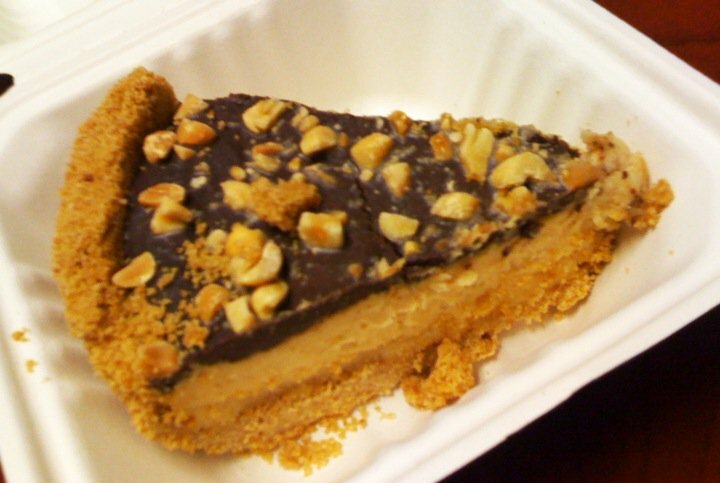 The topping is a chocolaty layer with bits of peanuts in it and the the crust is a standard graham variety. It is the middle section that makes this amazing and it’s unlike anything I’ve ever had. It is not too overpowering in peanut flavor and not dense at all. It has a silky texture that is so smooth and creamy but not too rich that you won’t be able to inhale the whole thing in a few minutes. My coworkers and I haven’t been able to figure out what the main ingredient in middle section is yet. Cream cheese? Sour cream? Whipped cream? Fluff? I have no idea. We have our theories but I know if we tried to re-create it that it wouldn’t match the original so why bother. Pacific pie doesn’t charge a lot for pie heaven. Waffle sandwiches…dreamy stuff if you ask me. I’m definitely on board the waffle craze. It’s portable, compact and it can be savory or sweet. I don’t care if people call it a fad either, as long as it’s a tasty fad then I’m in full support of it. I was downtown for a meeting, which is never an exciting thing for me, and I needed a quick sugar pick me up to get me through the next hour. The sweet fix I needed suddenly appeared before me when we parked in the same lot where the Flavour Spot cart sits at. I was going to get a plain nutella but then I noticed the Fifth Avenue waffle. Half nutella and half CRUNCHY peanut butter! Say what? I was sold on this immediately. What a fantastic combination and now I’m wondering why the heck didn’t I think of this on my own. I’ve dipped peanut butter cups in nutella so I was on the right track to something spectacular but never quite made it there. The Flavour Spot made me realize the obvious. Nutella and crunchy peanut butter are made to be together all warm and gooey nestled in a freshly made waffle. 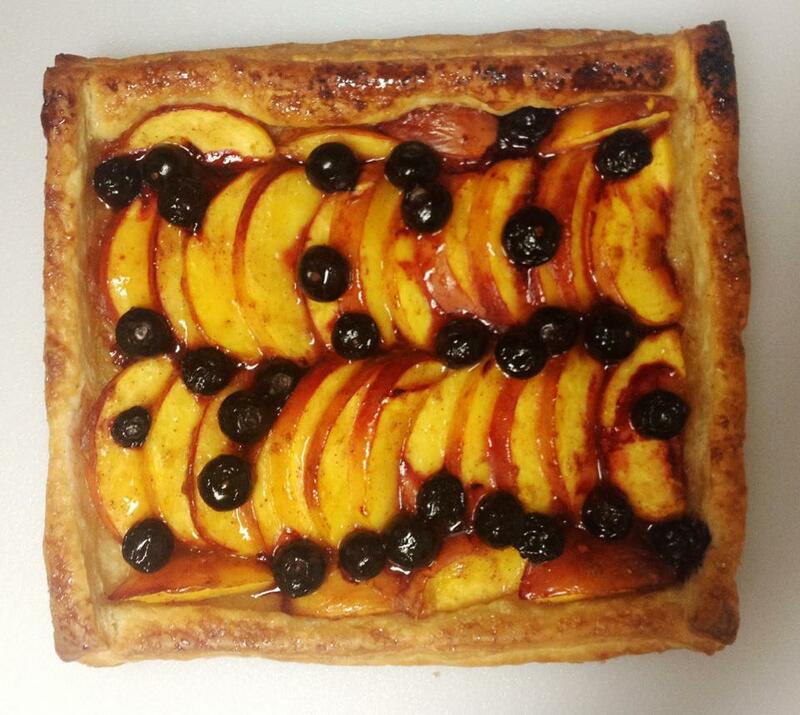 Is your mouth salivating just thinking about that? Because it should be.